You've seen it. It's piqued your curiousity -- or instilled in you that all-consuming feeling of technolust, as it did in my classmate Charity. Charity saw the Gemini, experienced the technolust ... and asked for a demo unit. I got a chance to play with it myself (she was nice enough to let anyone in school test her demo unit). 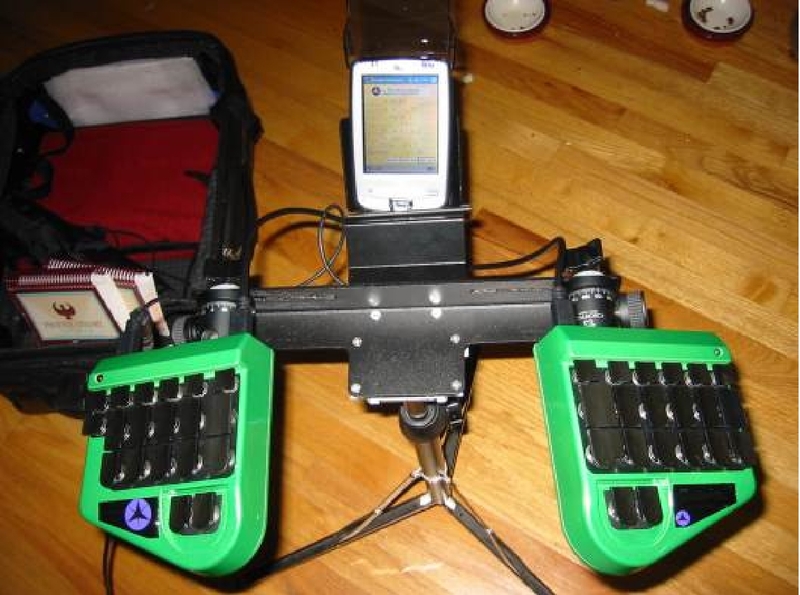 The touch was very light, as the keyboard does not use Stenograph's design. My initial thought: Like anything, this would take some getting used to. Fortunately, Charity was nice enough to write about her experiences with the Gemini and the PDA for my (cheap and sleazy) website. And now, heeeeerrre's Charity! My shoulders hurt. My wrists hurt. Whoops. Now I'm starting to develop familiar ache that's a precursor to a deeper soreness, numbness, and uncontrollable twitching in my outer fingers. 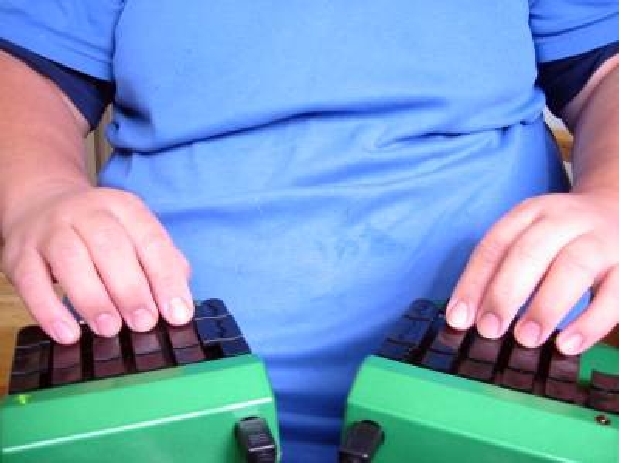 Surely someone's thought about keyboard ergonomics out there for stenographers! So I look and find the split keyboard put out by Robson Technologies, Inc., and now supplied by the Neutrino Group out of Colorado. The Gemini is purportedly to be ultimately easier on the hands and wrists; it's paperless and has no on-board memory or software. 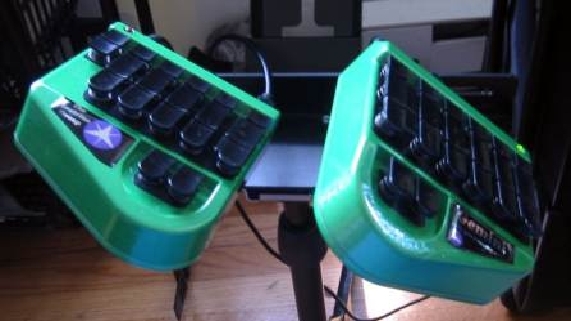 It's an electric keyboard. Period. So I get one on a two-week trial. 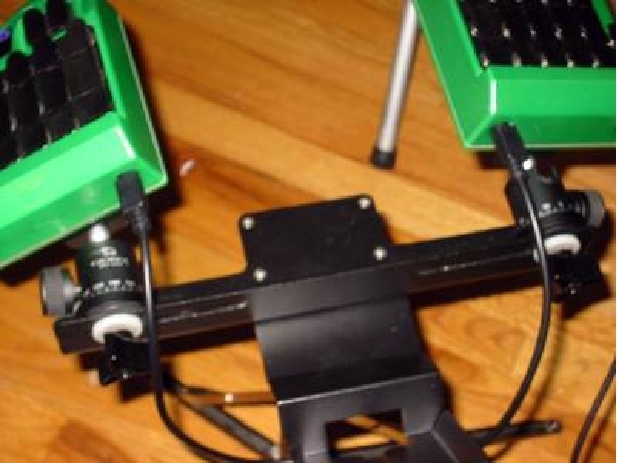 A trial setup is the Gemini keyboard, the relevant power and computer cables, tripod adapter, and setup manual. Laptop and CAT software you should have already, or a very understanding school that'll let you plug a strange peripheral into their machines and change software settings. Hi. I'm Charity and I'm a evening student at the Court Reporting Institute (CRI) in Seattle. Note: CRI closed as of August of 2006; you can read the details on that here. As of this writing, I've only had the writer for four weeks and the PDA for two. (b) Pitch: bottom edge relative the top be level, above (tilt back), or below (tilt forward)? The ball-and-socket joints have markings, presumably so that you can always find your preferring setting -- doesn't work for me. I have to spend a few minutes adjusting, typing a few phrases, and adjusting again until I find the "ideal" setting of the moment. The numbers are irrelevant. It's a time hog. Fiddle, fiddle, fiddle. But on the other hand, should a wrist or hand or finger be stiffer than the day before, I can compensate for it. ... and Fiddle some more! Up 'til now I've been using the Stentura 200. Yup. 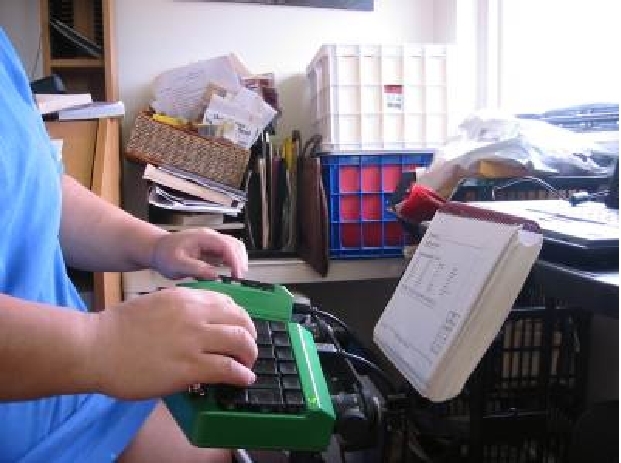 The good old manual Smith Corona of the steno world. The second challenge is learning to control impact. 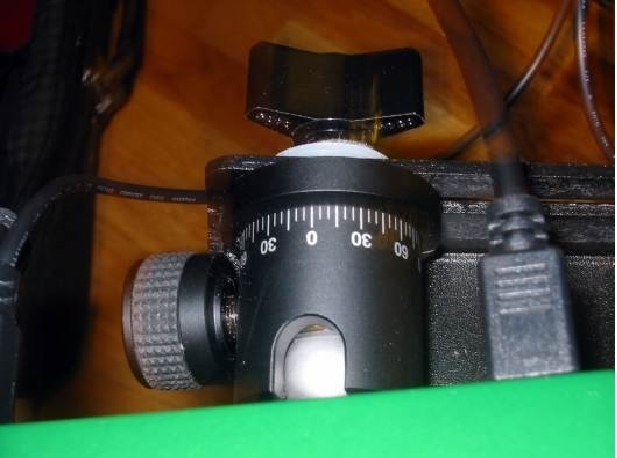 If the knobs aren't tightened enough in the first place to withstand a certain measure of pounding, the keypads move and the "ideal" setting you've spent the last quarter hour finding is moot. 'Course, the goal is NOT to pound the keys. That's what was advertised when I ordered. A few details here on what I got and why I nipped down to the nearest bar and ordered a large cup of strong coffee heavy on cream and laced with genuine Irish Whiskey and a thermos to go. Standard colors (and what you get for the trial period) are a very businesslike matte textured black, grey, and burgundy. These are returnable should you buy one and then later decide to return. I optioned for a custom color and ordered "emerald green" and expected something equally matted. Someone have leftover car paint? Don't mistake me, I love the metallic look but it was unexpected and have no idea if the other colors use the same type of lacquer. Don't know if the Neutrino Group ever thought of setting up a paint chip panel for mail-out on request for clients considering non-standard colors. Custom colors are non-returnable. 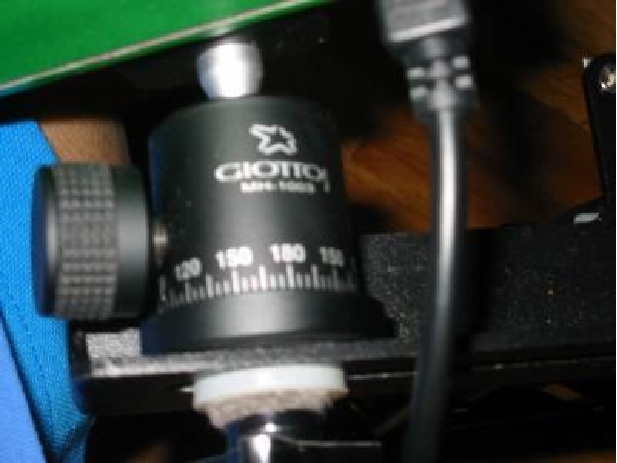 The cables are touchy as any computer peripheral--just make sure you don't bend the pins when plugging them in. The power cable I got for the trial didn't work and so Neutrino Fed-Exed a replacement. 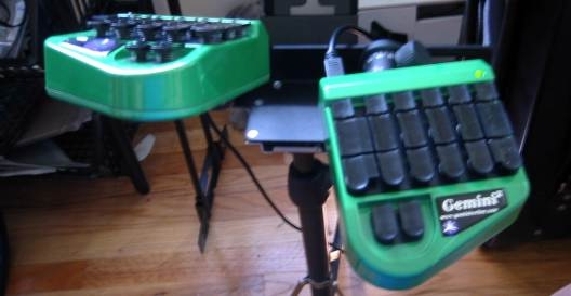 It would be nice if the central cable connecting the keypads together were longer--I have future fantasies of Velcro-ing the pads to the end arms of a lazyboy chair. It's assumed you already have a tripod, possibly from the machine you've just decided to replace. It fits easily on enough although I miss the "click" of it locking into place. 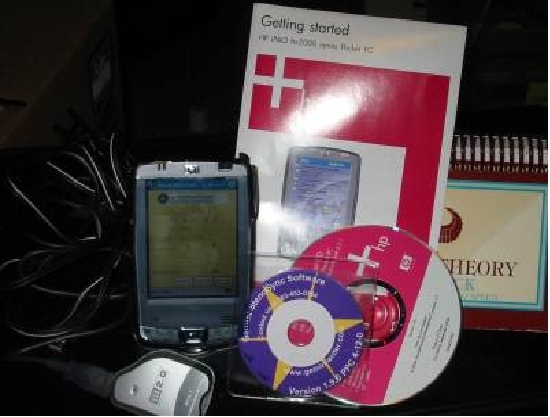 PDA & Software: I received an HP iPAQ 2000 series Pocket PC plus a 128 MB CF card, a 128 MB SD Flash card with SD card reader, a PDA recharger/cradle for USB hookup to your laptop or computer, and the appropriate setup software. 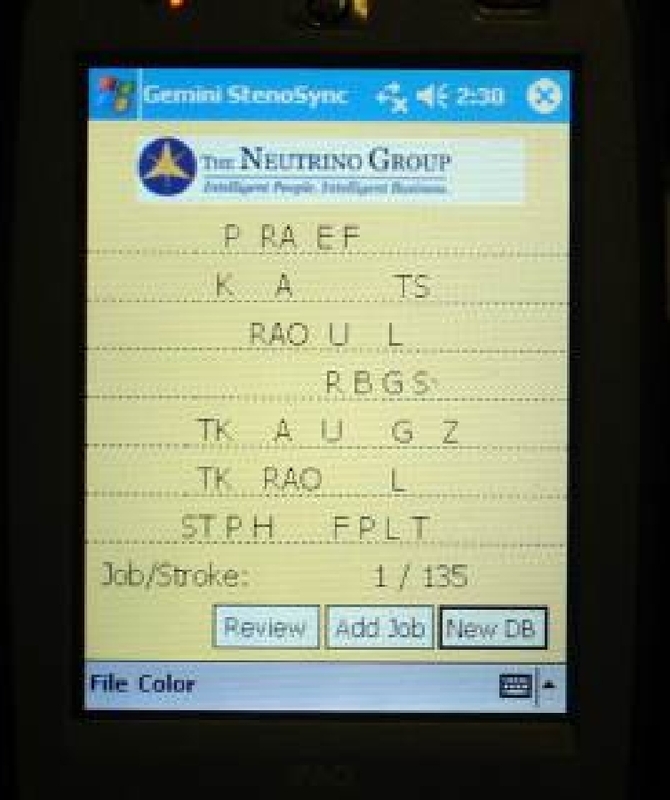 The Gemini StenoSync software for desktop and Palmtop, copy of Adobe Reader (ignorable if one already has a copy or newer version already installed). A missing software piece that has to be e-mailed to you from the Neutrino Group is the Crossfire client software and release codes to enable data transfer/keyboard interface. 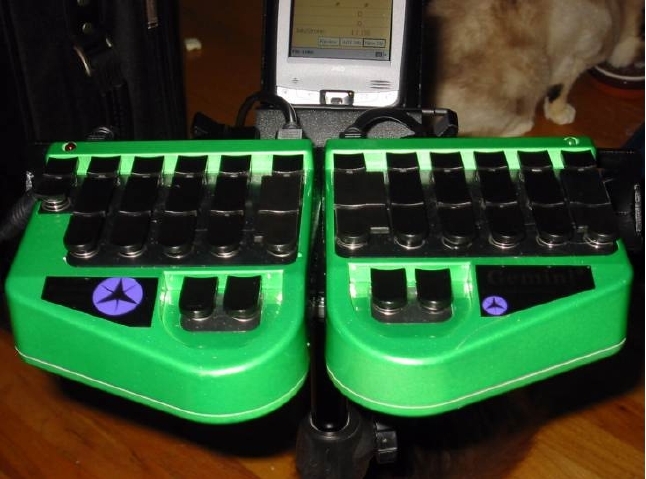 Now the StenoSync only records raw notes. No translation -- that's done by whatever software package (ally CAT?) you've picked up (Eclipse, Rapid Writer, DigitalCat, etc.). I know, I know. Typo! Dogs is "TKAUG/Z"
But so what. You're suppose to be able to read your "paper" notes in the first place without relying on translation. Especially in school. Theoretically I can now leave my laptop at home and transcribe from the PDA's display file unless the teacher says she wants to see the raw notes. A quirk I don't like is that the exported file from the desktop end dumps the file in the root of your main drive with an automatic naming convention of "FILE.###", e.g. : C:\FILE.001--to me that means a computer crash-created hex-dump. If you should start up your computer with, say either the SD or CF chip pre-inserted into a card reader and the chip's full of "FILE.###", you'll get a confused error claiming format problems on such-and-such drive and would you like to format? I didn't see an option to redirect the export to a safer location. Data Transfer -- I'm currently not using the Bluetooth option because I don't have my laptop set up for that and I don't need that extra expense and headache right now. So it's: steno in untranslated data, save to flash card, pull out flash card, plug into laptop, and feed file to the CAT. Or, if I don't need to turn in steno notes, I'll play the CAT and wordprocess the raw notes right from the PDA (which at this point in my learning I prefer to do). Of course, the PDA may be overkill at the student level. It would certainly cut costs to omit. It would also save you a lot of the hassle of software installation and operating system updating (see Software Manual). As for me, I'm looking forward to playing with this new toy as time (and budget) permits. Neutrino comes right out and says it's a rough draft. No kidding. Most of the stuff is concerned with helping you set up the Gemini and in showing you pictures of the screens you'll see during software installation. Great until you're past that point. But then again, as I've said before, this is my first PDA and I'm sure that some of the data transfer problems I've had is simply from my lack of experience in using a PDA. I am also still learning all the features in DigitalCat. To be fair, none of that is Neutrino's responsibility to teach--you get the PDA, you read the manufacturer's manual. Ditto your choice of CAT software. The carrying case received is a Targus laptop bag not necessarily designed to coddle a Gemini keypad. It's a good sturdy case but I already have a Kensington saddle bag I prefer (backpack straps) to use if I'm going to tote just my laptop around, and I can even fit the Gemini in. But for school, there's the laptop, the tripod, the Gemini, the cables and backup batteries, books, and dinner and coffee thermos. So here's an advertisement for the Flightable. 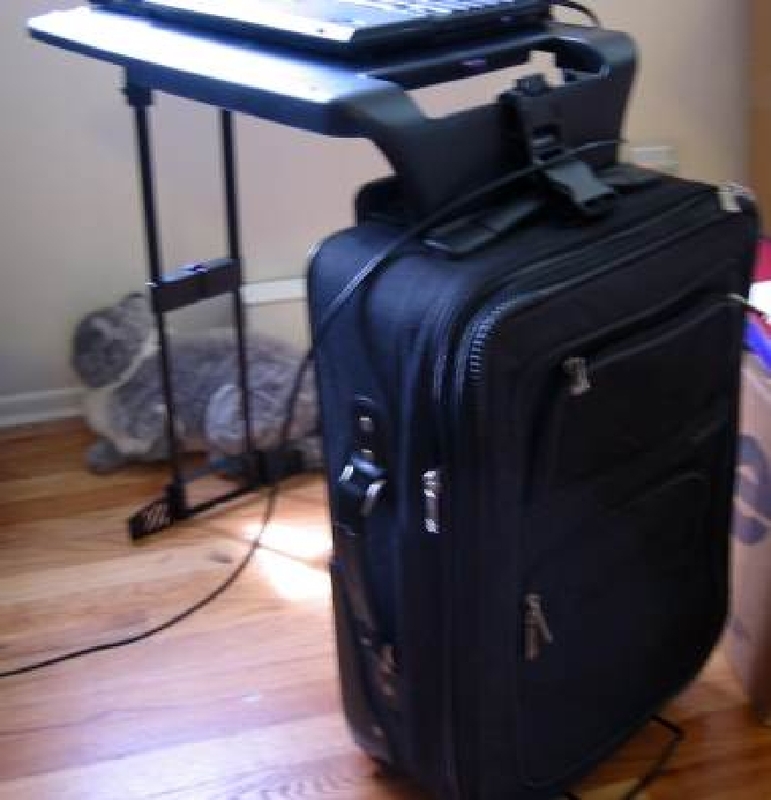 The Flightable: Steno Case and Table -- Combined! -- and the theme is "let's get physical." I personally love the flexibility of the keyboard. That's the first, last, and only thing I am concerned with. My shoulders aren't hurting, nor are my hands. I still slump a bit when I'm concentrating but that's another matter.